Have Your Voice Heard in APIAVote’s Presedential Town Hall! | JACL PSW in Blogland! Have Your Voice Heard in APIAVote’s Presedential Town Hall! Check out APIAVote’s youtube page! Asian and Pacific Islander Vote (APIAVote) invites you to be a part in the Asian American & Pacific Islander Presidential Town Hall to take place THIS Saturday, July 21, 2012 at George Mason University. APIAVote is a national nonpartisan, nonprofit organization that encourages and promotes civic participation of Asian Pacific Islander Americans in the electoral and public policy processes at the national, state and local levels. 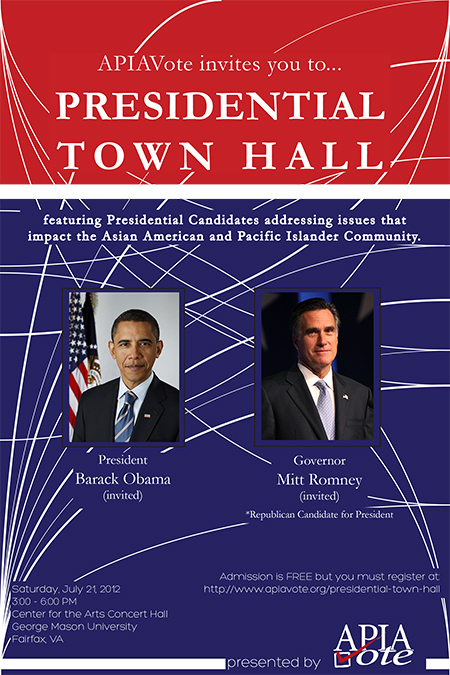 With the support of national and local Asian American and Pacific Islander (AAPI) organizations, we will be expecting more than 1000 community leaders, elected officials, voters, and students representing this diverse community from across the country that will be participating at the National Presidential Town Hall hosted by our Asian American and Pacific Islander community. The format of the town hall will allocate time for the Democratic and Republican presidential candidates to address the Asian American and Pacific Islander Community. APIAVote hosted this historic event in 2008 because previously the Presidential candidates from both parties have never addressed the community on a national level. Incorporated into the town hall, we will focus on uplifting the importance of the AAPI electorate and the 2012 Policy Blueprint for Action produced by the National Council of Asian Pacific Americans. As a result of the growing excitement and to ensure that organizations and individuals located outside Virginia participate in the Presidential Town Hall, we hope that you will be to participate as a host of a Presidential Town Hall Viewing Party. Specific instructions are forthcoming, but in general, depending on the size of your home or of your venue, invite 20-100 people to your home, local library, community center or student union to watch the event be streamed live. All you need access to is a computer and internet access and the ability to either project it through a lcd projector or television set. We only ask that you allow us to list you and/or your organization. Our goal is to have 200 viewing parties nationwide! Please let us know if you are interested in hosting a viewing party by emailing events@apiavote.org!